▶ SoldThis listing was sold on Dec 12, 2017 for the price shown here. 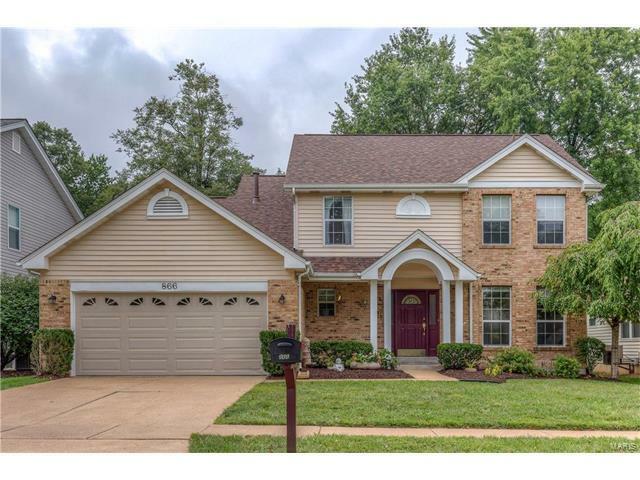 Beautiful 2 sty home located in a convenient Ballwin location! Have fun with family/friends in a home that provides enough room for everything you do that makes life special. Separate living rm and dining rm w/bay ready for dinner parties or gatherings. Lovely vltd family rm w/bay and cozy gas FP begs to entertain guests and flows freely into an open breakfast rm and kitchen, all of which span the entire back of the main level and exit onto a fabulously large brick patio w/a peaceful, flat yard raised slightly above it. The large vltd master brm suite has a walk-in closet and master bth w/double sinks and a separate soaking tub and shower. There are 3 additional nicely-sized bd rooms on the 2nd flr w/a full hall bath. The finished LL provides even more space to entertain or relax! Workout room, half bath, storage and plenty of space for whatever your heart desires. Newer roof, '15; New A/C unit, '17; new water heater, '17; new stove, '17; new retaining wall, '17. Welcome home!! Manchester Road between New Ballwin Road and Clarkson Road, to south on Reinke Rd to left on Kylewood Place. Home is on the right side of the street.